I have a super duper simple and last minute Christmas Card Craft for you today. And one that very young children can help with too!!!! We made them, as Pip Squeak, watched me assemble our Teacher Appreciation Card and wanted to colour in some “baubles” too. 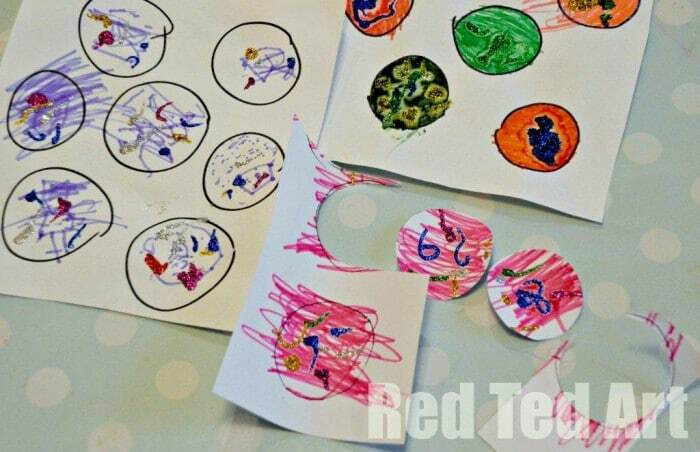 So I drew some rough circles and let her have a go. Red Ted did some more too, but we haven’t finished his cards yet. I will have to add them at a later date. 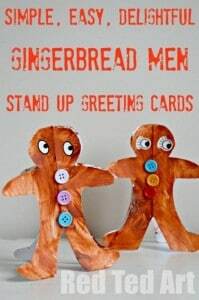 (If you want another Chirstmas Card idea, check out our Gingerbread Men too). 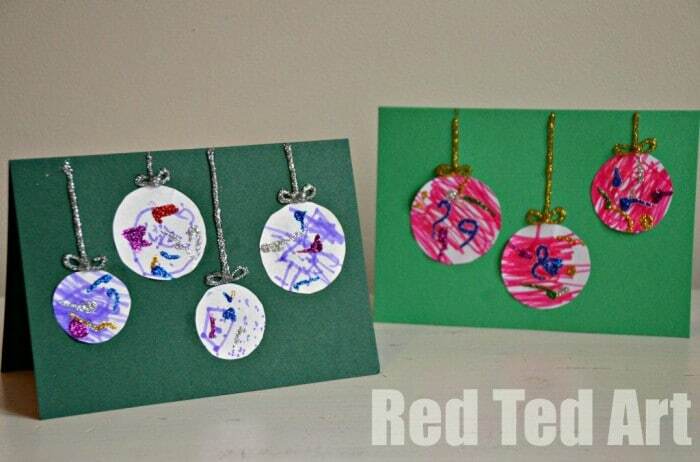 3) Add detail in glitter or with a ribbon to represent the baubles “hanging”. Job done. So simple and I think they look really cute? Pip Squeak LOVED making these. 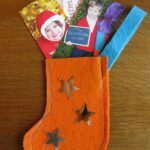 Join the Kids Get Crafty linky party! 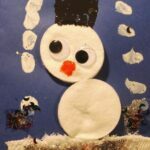 Disclaimer: by joining the Kids Get Crafty linky – you give us permission to highlight any projects on Red Ted Art and Creative with Kids or share your craft ideas on Pintrest – I will always link to your site! 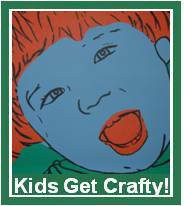 If you have been crafty with your kid’s be it at home, in the kitchen or outdoors, please link up! 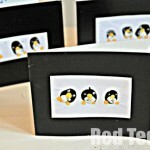 They are super sweet cards. I hope my activity is ok because I didn’t do it with my children but you could so easily. It’s my first post in my new location too. Feel free to delete it if it breaks any rules. Oh of course that is fine!!!! 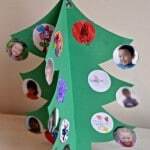 Kids Get Crafty is “with and for” kids and I love your gingerbread ornaments 😉 I am only really “strict” when it comes to Kids Get Arty!!! 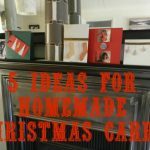 These are wonderful – I think T could make some as well – in fact we may just have a go to do some this morning for aunts and uncles. Thanks for the party Maggy!!! These turned out really cute. We made an ornament from craft foam but I really like the ornament cards look. Such a great idea, and they look brilliant! I always love a nice and simple craft for the little ones. 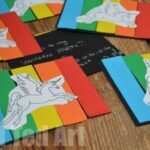 Sometimes I get carried away thinking up crafts we could try only to realise that my idea of a fun craft is not always the same as my two-year olds! Adorable! 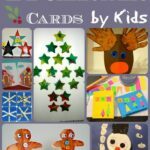 What a fun way to get kids to help with cards! And Merry Christmas to you to Single Married Mum! You always have so many awesome, creative ideas, Maggy! I often find myself pinning your posts. Thanks so much for hosting Kids Get Crafty! What a very lovely thing to say, thank you Deb!! They look so lovely, actually anything your children have a go at just makes it all the more special. Yes, I do love things made my kids! I love handmade cards by kids. They are super sweet.